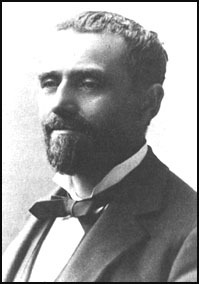 On March 12, 1902 John Peter Altgeld was just finishing a speech at a pro-Boer mass meeting at the Joliet Theater in Joliet, Illinois when he became dizzy and had to be assisted from the stage. He was taken to a hotel and his condition did not appear to be too serious, but shortly before midnight he became unconscious and died from a cerebral hemorrhage. Upon hearing the news, Clarence Darrow raced to Joliet. "My dear, dead friend, long and well have we known you, devotedly have we followed you, implicitly have we trusted you, fondly have we loved you. Beside your bier we now must say farewell. The heartless call has come, and we must stagger on the best we can alone. In the darkest hours we will look in vain for your loved form, we will listen hopelessly for your devoted, fearless voice. But, though we lay you in the grave and hide you from the sight of man, your brave words will speak for the poor, the oppressed, the captive and the weak; and your devoted life inspire countless souls to do and dare in the holy cause for which you lived and died."